The following day was a Saturday. Koremitsu was tying the laces of his sneakers, and Shioriko, holding Lapis in her arms, looked devastated as she approached him. Recently, Koremitsu had been really busy over the matters regarding Tsuyako and Aoi, and he did not spend time with Shioriko even at home. He felt a pricking pain in his heart, probably sensing that he had made her lonely. Shioriko lowered her eyes, looking utterly devastated, and this caused the pain within Koremitsu to pronounce itself. With a reluctant feeling, he opened the doors leading to corridor. Hikaru whispered softly at Koremitsu’s ears with amusement. 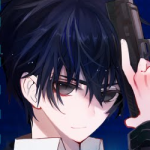 Koremitsu turned his head behind, and found that Shioriko, who had her eyes lowered gently just a while ago, was making a funny face like a mischievous child, gritting her teeth, ‘ii–‘ and making such a sound. She probably never expected Koremitsu to look back. Once their eyes met, her face reddened in an instant. She yelled, and teetered off to the inside. Hikaru was chuckling away, seeming thinking that this was unbelievably cute. Upon thinking about the future, Koremitsu felt a chill on his back. Koremitsu grumbled, scowling to hide his embarrassment. He had agreed to meet Aoi at 11am, at the train station nearest to the art museum. Miss Aoi will arrive 10 minutes earlier; as Hikaru had said this, Koremitsu arrived 15 minutes earlier. But even once the appointed time had passed, Aoi did not show up. Koremitsu grumbled, but as he too was a little concerned. He tried calling her on the phone. The message he got was that the phone was either not in the service area, or the number could not be reached. Hikaru’s expression was getting more anxious by the moment. 15 minutes passed, and Aoi had yet to turn up. And then, 20, 30 minutes have passed. During that time, Koremitsu had called her 7 times, and every single time, there was a caller’s response of the call being unable to pass through. Even Koremitsu’s face was becoming tense by the minute. What do I do? Do I go check out Aoi’s house? But this is different from the theme park date. We won’t meet if she’s coming here. Just when Koremitsu wanted to call Aoi’s number again, the cellphone in his hand vibrated. It was a private number, but Koremitsu hastily picked up the call. The voice that reached his ear however was as stone cold as ice. This sudden question came without an introduction. Koremitsu hung up on Asai, and hurriedly checked through his mailbox. Hikaru too looked on grimly from the side. Both of them stared at the small screen, their faces nearly touching each other. It seemed Koremitsu did not have anyone to send messages to. And thus, he spotted a message he did not remember sending. And the recipient was Aoi! He held his breath, and read the contents of the message. The message signal was flickering from time to time; it seemed Asai was furiously trying to call back, but Koremitsu was not in the mood to be bothered by her. “It seems the art museum is currently closed due to renovation works. There was also the location and time after this passage. Koremitsu checked through the inbox, but did not see Aoi’s reply. Koremitsu ran through the gantry gates, and barely managed to get on the train that was about to start moving. He wanted to get over to the written location as quickly as possible. He felt his gut nearly splinter as he rode on the train. The other passengers had moved aside due to this savage-looking youth gritting his teeth, his temples pulsating, and there was a wide space around him. His dry eyes were flaring, and all he saw was the time the mail was sent, 7pm the previous day. What was he doing at that time? Once Koremitsu recalled this, he grasped his cellphone firmly, nearly crushing it to bits. He finally made it through the gantry on the concourse. As there was a lot of people at the station, it was tough for him to move about without knocking into anyone. He and Hikaru split up to look for Aoi, but to no avail. He took his cellphone, and dialled Aoi’s number again. With such a wishful feeling, Koremitsu waited, only to be met by the voicemail again. During this time, the messages from Asai probably kept increasing. Tsuyako was already at the rest lounge of the recital venue. By the time Koremitsu arrived, she was dressed only in white undergarments, an alluring sight at that, and looked over at him with hazy eyes. Koremitsu asked, his teeth gritting. Beside him, Hikaru’s face was frozen in bitterness. If possible, they hoped that was not the case. But at the time the message was sent to Aoi, Tsuyako was the only one who was with Koremitsu at the park at that time, and the only possible person who could have sent that message. The thin undergarments wrapped around Tsuyako was just like a mourning gown, and she stared at Koremitsu with those lifeless pair of eyes. The determined, alluring Tsuyako was gradually vanishing in front of Koremitsu’s sights. The silhouette that took the shape of Tsuyako was gradually becoming blurred, disintegrating into a weak, ambiguous line. Did she do such a thing because she was jealous of Aoi, because she hated Aoi? Koremitsu felt his mind being pierced through hard. Lots of things, words, voices were jumbled up, echoing within him. Amidst the chaos, a singular voice rang with clarity. The straightforward eyes were staring right at Tsuyako. Hikaru’s eyes were looking at Tsuyako. Tsuyako’s lie. Tsuyako’s true thoughts. The hazy expression Tsuyako showed was infused with a little spark of emotion at that instant. That was true fear. There was a heartwrenching feeling. Hikaru asked in a tragic tone. After sending the message, she could have deleted it with just a little finger. However, she did not do so. She knew that if Koremitsu was to find out, she would be the first suspect! She knelt weakly upon the tatamis, her body cringed as she lifted her head, staring at Koremitsu. On the night of the garden party. Tsuyako was standing in the midst of the ripped flowers, but the hands that clasped Koremitsu’s face and pulled him in were so white, tender, beautiful, speckless, and there was an icy feeling to the touch. When she told Koremitsu of Rokujō’s name, her clothes and hair were ruffled, her eyes dangerous, and though there were many red flowers scattered everywhere, Tsuyako’s hands were pure and pretty. Koremitsu grabbed Tsuyako’s hand and raised it. Tsuyako’s face had turned completely pale. The eyes as hazy as the shrouded moon were gradually showing signs of life again. At the same time, the fear that was sealed away when she shut her heart was probably striking her again. She embraced her body tightly, starting to tremble. Hikaru knelt down in front of her. She indicated that she was jealous of Aoi, hoping that Koremitsu and the rest would focus their attentions on her, so that they could protect her. She taunted him, ‘are you able to stop Rokujō?’, sobbing, ‘there is no way to stop Rokujō. Do not get involved with me anymore.’ All those were the most Tsuyako could do to resist. However, that hand of Hikaru was unable to grab Tsuyako’s hand. So Koremitsu took his place and held it hand. As the only person present who could continue to express Hikaru’s will. Tsuyako lowered her head in trepidation. She wanted to lift her head, but shook her head intently again, and closed the lips that she wished to open. She was so bounded by the fear of Rokujō, she was unable to let out a single voice. Koremitsu grabbed Tsuyako’s hand tightly, and swore this with all his might, causing his body to heat up. Hikaru too was looking at Tsuyako with an earnest, prayerful look. With a troubled expression, she lifted her face at Koremitsu again. And Koremitsu glared back at her, ostensibly absorbing her eyes in. She lowered her eyes, opened her lips a few times again–her eyebrows were trembling as she spoke of Rokujō’s true identity and Aoi’s whereabouts with a voice so small if felt it would vanish. Hikaru’s voice became gloomy as a result. Koremitsu gently placed Tsuyako’s hand on the knee. He dashed out from the rest room. Hikaru too moved along with a serious look. At the entrance, they nearly bumped into Asai. The room was filled with a bright colored table, a sofa, exotic paintings and pots. The carpet no taller than the ankle was neat and glossy, and there was nary a speck of trash. It did not seem to be a place for the wounded to be sent to. –Mr. Akagi has an accident. He is currently undergoing treatment. Aoi suddenly heard these words when she was waiting for Koremitsu, and in shock, got on the car. However, after riding for a long time, she did not arrive at a hospital, but what seemed like a rural resort. –Alright, come in then. For some reasons, we cannot send him into the hospital. We have called in a doctor to carry out treatment, so please relax. The person spoke with a rich, sweet voice. With a gloomy feeling, Aoi entered through the door. However, it was still too weird. The building was too quiet within, and there was no presence of humans to be felt. There was something slightly sweet being burned drifting in the air, giving her a nauseous feeling. This time, Aoi spoke with a harsher tone than before. The other party gave such an excuse, and there was only one person left in the room. Aoi did not intend to sit on the sofa; the anxiety and doubt started to intensify, her skin feeling prickly as well. It was already abnormal that he could not be sent to the hospital. He said that he was to convey Mr. Akagi’s words to her, but if she were to think about it, it was unnatural. Aoi tried calling Koremitsu on the phone, but after rummaging through the bag, could not find her cellphone. Suddenly, Aoi felt goosebumps near her neck. Aoi’s heart was racing wildly, her heart breaking down, unable to make up her mind. The slight fragrance engulfing her nostrils caused the throat to be prickly, and her thoughts seemed blurry at that time. It came from the door at the side. Aoi placed the hand at the handle, opened the door wide, and the sweet smoke came out immediately, causing her to cough softly. Her eyes were teary, her head dizzy. However, when she spotted a painting in an extravagant frame on the other end, she felt shocked, as if she was doused with ice-cold water. That was a painting of Hikaru standing on the school staircase, whilst the bright sun was shining inside, looking back and smiling. Aoi had decided on this image as she tried drawing him, but she could not draw well as she hardly drew human profiles. Hikaru’s nose was not like that. His eyes should be clearer. His smile should be sweeter, gentler. She drew a little, and was troubled; she repeated this process over and over again, and finally, if it is this painting, I might be able to show it to Mr. Akagi, she thought. Asai gave lots of reasons stating that the painting was missing, but Aoi noticed that she was lying. The thief was probably the same person who stole her gym uniform, her textbook, and placed the wilted flower in the shoe locker. She stumbled about as she entered the room. She was engulfed in white smoke, the faint looming fragrance was causing her to be dizzy, and she covered her mouth with her hand. There was a large mirror on the right, and a transparent cage on the rack beside it. There was a chameleon with green scales, hissing its long tongue out. There was a crimson ceramic stove on the floor; the smoke was coming out from it. The bed was covered in a bright red cover, as red as poppies, and the painting was at the wall by the side, covered in a golden frame. Aoi was uncomfortable and hesitant as to whether she was to climb onto the bed, or to touch the bed; thus, she stood by the side, lifting her head to look at the painting. The familiar looking palette, brushes, gym clothes and textbooks were thrown into the trashbin. Upon seeing this, Aoi felt chilly. Aoi also recalled that Tsuyako had a scandal with Hikaru, for Hikaru was Aoi’s fiance. She was hated by Tsuyako to such an extent. Originally, the Udates and the Saotomes were competing families surrounding the Mikados, supporting each other as relatives, and opposing each other discreetly in the shadows. This was the unique relationship the two families had. Thus, Aoi had assumed that even if Tsuyako was unhappy with her, that was something that could not be helped. When Hikaru was alive, there were girls other than Tsuyako, girls whose names Aoi did not know of, who did such annoying acts. To them, it was useless even if she got angry or hurt by them. The only thing Aoi could do was to despise them. It was a coping mechanism she learnt, growing up in an elite environment where she was envied by others all the time. The rich, sweet voice cause Aoi to freeze. She turned around, and found a slender, bespectacled youth holding a tray of red teacups. Hikaru’s older brother, Kazuaki Mikado, stood there. His thin lips showed a gentle smile. That ordinary looking youth, or so he was described as, seemed to have become another creature altogether amidst the swaying milky steam. That creature was slowly approaching her. The chameleon slithered its long tongue in the rectangular cage. While the voice seemed as sweet and gentle as Hikaru’s, the face was anything but; it was like a serpent, an ominous face and lips giving off such a voice. It definitely was not the polite, bumbling, goody, ordinary Kazuaki Mikado Aoi knew of. He took a small step forward. Aoi cringed back, and glared. Kazuaki again showed a smile from behind the smoke. His beady eyes were showing a condescending look. He lowered his body as he held the tray, and said softly to the chameleon slithering its tongue in the cage. The smoke was seeping into her throat, and her head was dizzy, her legs unable to exert strength. Her knees probably would have buckled if she was not angry. Sensing danger, Aoi tried to leave the room, but Kazuaki put the tray down, and blocked the door. With a smirk, Kazuaki gently spoke. The eyes looking down at Aoi were gradually becoming icy too. Kazuaki stared at Aoi with an icy look, gradually approaching her. The smoke was spreading bewitchingly, and the chilling uneasiness and fear struck Aoi amidst all these. After being invited to the art exhibition with Koremitsu, she cancelled the appointment with Kazuaki to go to the classical music concert, saying ‘I cannot go as there is something at school…sorry’. That was a fact. The guilt was pricking her chest, she wanted to patch things up with Koremitsu no matter what. However, this Kazuaki that appeared in front of Aoi was one that inspired fear and trepidation; the demonic smile was closing in. Aoi backed away little by litle. Once the heel touched the wall, her heart chilled. There was a bed with bright red covers by her side. Beside the bed was a golden-framed portrait of Hikaru gently smiling. To prevent Aoi from retreating, Kazuaki pressed his hands on the wall. His flat face was right above hers. The uneasiness and fear caused Aoi’s petite body to tremble. The warmth in Kazuaki’s eyes was diluting. To Aoi, frigid air was even seeping from his body. “You were the first choice for my fiancee back then, Aoi. However, it was said that Hikaru would be a better choice, and your father, who really doted on you, used the reason of you wanting to marry Hikaru to reject my mother’s proposal. –Aoi, if Mr. Kazuaki’s mother wishes for you to be her daughter-in-law, what will you do? That was when Aoi started her elementary school life. Her father placed her on his lap, asking this. –It seems young Hikaru’s father wishes for you to be Hikaru’s bride. Who do you wish to marry, Mr. Kazuaki, or Hikaru? At that time, Aoi was still young, and she did not know how massive a power the Mikados was, what relationship her family clan had with the Mikados, and how they intended to get along in the future. But even so, she was about to tell from her father’s tone that her reply would affect Hikaru’s position in the future. Hikaru was the child of a mistress. There were a few times where she heard of the adults murmurings, saying that Hikaru was ‘a child that should not have been born’, that normally, Hikaru was an entity who could not even step into the Mikados household. But if Aoi was to marry Hikaru, Hikaru would have the Saotomes backing him. The daughter of the Udates and the daughter of the Saotomes were meant to marry the Mikados’ heirs. According to the conditions of Aoi’s marriage, everyone would have to recognize Hikaru as a child of the Mikados, and Hikaru could be protected under the Mikados’ name. Aoi did not understand this much. But even so, if he gets engaged with me, Hikaru might not be called a child ‘who should not be born’. That was what Aoi thought. I want to protect Hikaru. Thus, with her cheeks red, she pouted her lips in a seemingly angry manner, stealthily whispering her answer with her all might. –If I am to get married to Hikaru, I can continue to play with Asa…I will choose Hikaru then. The engagement was decided by the two fathers. That was what everyone else said. In fact, it was an unavoidable fate for her as the eldest daughter of the Saotomes main family to marry either Hikaru or Kazuaki. However, Aoi herself was the one who chose Hikaru from the two. It had been 10 years since that incident, and being chided by Kazuaki over this matter had caused Aoi to be confused. Up till this point, Kazuaki had been interacting with Aoi as an elder, though unreliable older brother; they had never held such a conversation once. However, he probably felt vengeful over Aoi’s refusal to be engaged to him. With an icy stare of disgust and condescendence, Kazuaki glared at Aoi, curling his lips demonically as he smiled. At that moment, it seemed that even the breath Kazuaki let out was frozen. The numbing fear passed through her back, causing her limbs to become numb, her throat dry, her breathing ceasing. She felt as if her heart was grasped by a venomous claw, causing her to nearly shriek. Till this point, she had been envied by others. There were girls who liked Hikaru, heaving verbal abuse upon hear before. However, those paled in comparison; he was showing him such filth, distorted malice and hatred, causing her to tremble. Kazuaki’s hand gently caressed Aoi’s face. The hand, as damp as a fish’s fin, brought a sensation that caused goosebumps to rise on Aoi’s skin again. She only felt disgust from within, but was unable to let out a voice. The damp hand stroked Aoi’s chin and ears, raised her dry, silky straight black hair, and dropped it. Aoi finally managed to say this. But Kazuaki merely felt amusement as he cackled. Mr. Akagi is not a shaggy dog. She was so terrified her legs were trembling, but once she heard him insult Koremitsu, Aoi was so furious her head was boiling. Using her hands, she pushed Kazuaki away hard. It had nothing to do with pedigree. It had nothing to do with identity. The boy called Koremitsu Akagi was straightforward, honest, and a gentle person. Aoi knew all of that! Kazuaki stumbled, but grabbed Aoi’s shoulder immediately, pushing her back onto the wall. With a loud thud on the wall, Kazuaki’s fingers were entrenched into her shoulders. As the head had hit the wall, she was starting to feel dizzy. The chameleon inside the cage let out a monotonous hiss from the throat. ow… so fast… so much suspense..
o dam! Shiet just got real. Thought Akagi’s logic was weird in the last chapter. I see… even male could be rokujou… and he want to r**e aoi?? run aoi !! Wow, that’s quite intense. Thank you for the translation! Do you mean “you don’t want me to find out” or is this just worded really awkwardly.